How do I store the awning for winter? Retract the awning or canopy for winter. If your awning has a hanging valance, remove it by sliding it out from the front bar. Put it in a well-ventilated dry area where it won’t be bothered by squirrels or mice. Don’t store it in a plastic bag, as this will trap moisture and could produce mildew. See the image on the right for more detailed instructions. Can I install the awning myself? Our awnings come with a variety of options and the best way to find out about them is to contact Suburban Construction. How effective are the awnings at providing shade? What is the effect of awnings on my utility bills? Awnings will lower your cooling costs. In addition, the benefit of retractable awnings is that you can allow the winter sun into your home for extra warmth. Can the awnings be used in the rain? Awnings are primarily a sunshade, not a rain cover. As such, the fabric is designed to "breathe” so you don’t swelter under your awning. Our Teflon® coating helps repel moisture, but it is not waterproof. Keeping the awning extended during a heavy rain will cause water to collect in the fabric and could cause the awning to collapse. What is the minimum height requirement for mounting an awning? The mounting height is a function of the projection. A minimum of 80 inches is needed from the front bar of a fully extended awning, to the ground. The mounting height must be higher - how much higher depends on how far out the awning projects. Awnings can be mounted on your roof to add height. How big can you make the patio awnings? Our patio awnings extend up to 16'5. A professionally installed Slim Fit Awning can be as narrow as 5'1", and the Estate awning can be as wide as 41 ft.
What if I get tired of the color? The fabric can be replaced. Suburban can replace the fabric at your home or business, or the awning can be shipped back to the factory and re-covered. How does the automatic sun and wind detector work? State of the art electronic sensors extend your awning automatically when the sun comes out and retract it at night. The wind sensor retracts your awning automatically when wind gusts above 20 mph. The wind sensor overrides the sun detector for damage protection. I was told to keep my awning plugged in, even during the winter. Why? When you unplug your awning for an extended period of time, you will lose the programmed settings for automatic stop and the awning will have to be programmed. Can we adjust the pitch of the awning? The pitch of the awning can be adjusted by the installer to meet your shade requirements. The Vario-Valance is a great addition to protect you from the glare of low setting sun, and provide privacy as well. What kind of material do you use for the fabric? 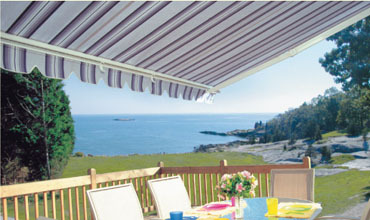 Aristocrat awnings come in your choice of beautiful, solution dyed acrylic fabrics. Unlike old-fashioned canvas awnings, acrylic dyed fabrics will not mildew or rot. There are more than 100 choices, in solids, stripes and tweeds, and all fabrics are covered by a manufacturer’s warranty. Fabrics in the Northport collection carry a 12 year warrany and are Teflon® coated help repel dirt and water without diminishing air permeability. What causes "dimples” in the awning? Dimpling is a natural occurrence with products that use a roller tube. The hems and seams are tighter than the single layer panels. This sometimes causes dimpling next to the seams, hems, or the center of the fabric panel. This dimpling is natural to acrylic fibers and does not affect the quality or durability. How do I keep my awning fabric clean? If you want to keep the fabric looking fresh, the fabric should be cleaned regularly before substances such as dirt, bird droppings or residue from your roof are permitted to accumulate and become embedded in the fabric. Why don’t the elbows of my retractable awning straighten out when the awning is open? The lateral arms will be flexed, but locked, at the elbow when fully extended. This is a normal part of the frame design. They will never fully straighten out. Trying to do so will damage the awning. Should I oil the moving parts? The aluminum components have a durable finish and the joints are self-lubricating. Aristocrat awnings are designed so that maintenance is not normally required. However, it is a good idea to hose off the framework and wipe it with a soft cloth at the start of the outdoor season. Lubricate the moving parts yearly with a dry silicone spray to maintain optimal, quiet operation. If unusual creaking occurs when operating, try lubrication before calling Suburban. The most prevalent place where an awning needs lubrication is at the end of the roller tube, on the side opposite the motor or gear. A bit of spray lubricant on the axle bushing at this point eliminates almost all-squeaking noises. Be sure to keep the spray away from the fabric. Can I leave the awning out in the rain? A light rain is okay - but water should not be allowed to collect in an extended awning. This could stretch the fabric or leave a stain...and could add so much weight that the awning could fall. How can I keep birds from nesting in the awning? Choose an awning with a hood and tray – or a Manor® style awning with a completely closed cassette feature. How can I remove a stain on my awning? Clean stains immediately with soap and water suing a soft brush or cloth. Can I order matching awnings for my windows? What should I do if the motor isn't working? Shade products come with a variety of motors, and you should refer fist to the operating instructions that came with your awning, canopy or shade. Contact Suburban Construction if you have any questions or concerns. Avoid thermal overload in the motor – which will result from repetitive use. The motor will disable itself for a 15-20 minute cooling period rather than allow itself to be damaged by excessive heat. This is a designed-in safety feature. Children should not be allowed to play with the remote control or the awning operating switch. How to I replace the bulb in my light bar? Unplug all power to the light bar, switch off the main circuit breaker, and let the bulb cool. Using a screwdriver, loosen and remove all screw securing the end cap and plant on the front bar of the awning. Remove the end cap and plate. This will give you access to the light bar protective lens cover. Remove it, by pulling and sliding the lens cover out of the front bar track and set aside. This will expose the bulbs. Remove the old light but by rotating 90 degrees and gently pull outward. Insert the replacement bulb and rotate it 90 degrees to lock into place. Re-attach the end cap and plate with screws and tighten until snug. 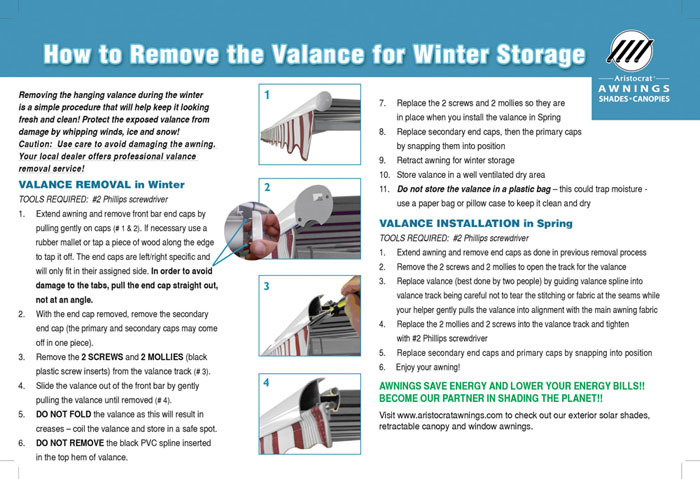 See the informational packet that was included with your awning paper work for more detailed instructions. Where can I find replacement bulbs for my light bar? Any lighting store or "big box" retailer that carries light bulbs should have standard T-5 fluorescent bulbs. Will solar shades save money? They pay for themselves year after year in reduced energy costs and protect you furnishings from harmful UV rays that may cause fading. Please enter the number 76912 in the box provided below.